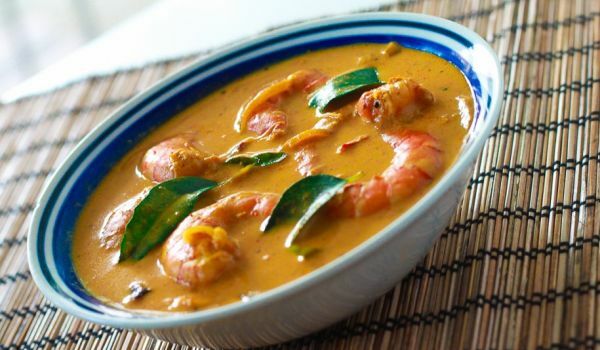 The Coconut Prawn Gravy is a spicy prawn curry made with chili, coconut and an assortment of other spices. It goes well with steamed rice and is also easy to prepare. Heat 1 tsp coconut oil. Fry grated coconut, fennel seeds and chopped onions till brown. Blend it well with water. Roast the turmeric powder, chilli powder and coriander powder. Mix the roasted powders with chopped tomatoes, garlic, blended coconut, salt and tamarind paste. Now add 2 cups water and cook till the mixture turns thick. Add prawns and cook till done. Adorn with fried curry leaves. Coconut prawn gravy is ready.